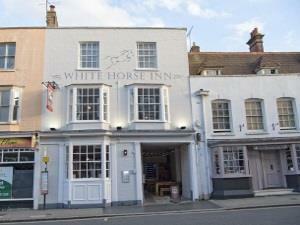 The White Horse Inn01621 840308work Guest AccommodationAn attractive blend of rustic charm and modern style, The White Horse is a popular high-street pub that provides a great place to dine, drink and stay in Maldon. For those just popping in for a pint, there’s a choice of ales and lagers from Shepherd Neame, Britain’s oldest brewer, alongside wines, spirits and soft drinks. The menu offers traditional British food, crafted from locally sourced ingredients and served in a stylish restaurant. If you’re planning on staying in town a little longer, then take a look at our five en-suite guest rooms. Some of the best B&B accommodation in Maldon, The White Horse offers everything you need for a relaxed and stylish break, with rooms beautifully presented and equipped with a range of modern comforts. An attractive blend of rustic charm and modern style, The White Horse is a popular high-street pub that provides a great place to dine, drink and stay in Maldon. The White Horse is a busy town-centre pub, with restaurant and bed and breakfast facilities, in the historic town of Maldon close to the Blackwater Estuary. The open water, mudflats and saltmarsh provide one of the most important habitats for wildlife in the UK and are a fantastic resource for walking, boating and fishing.